On March 13 Eileen Carson Schatz was diagnosed with Stage III pancreatic cancer. On June 12, after three months of aggressive chemotherapy along with collective prayer and visualization to shrink a tumor, Eileen had a Cat Scan at the Johns Hopkins Pancreatic Cancer Clinic to check her progress. Mark and Eileen are happy to report that with two more months of chemo followed by targeted radiation, Eileen will be a good candidate for life-saving surgery, which is the only path to a cure for this pancreatic cancer. Because of the debilitating effects of the illness Eileen has had to step back from the things she loves most - dancing, singing, and presenting her arts integrated residencies in the schools. 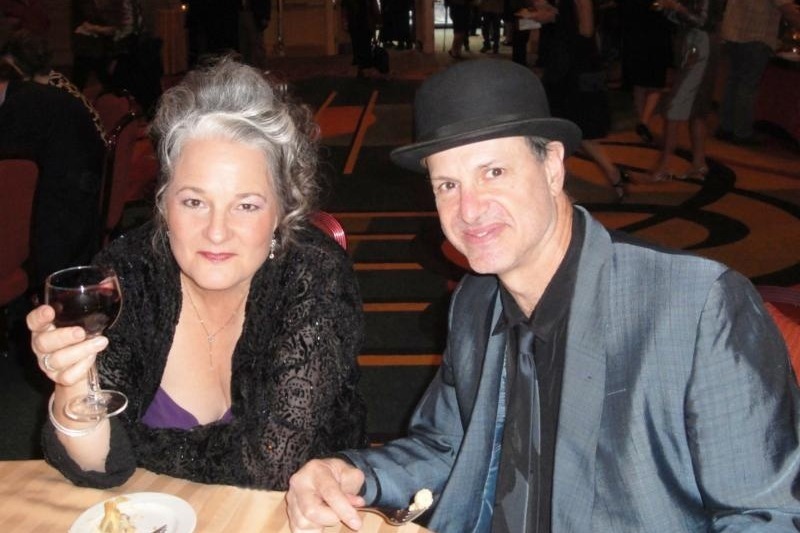 Her husband, Mark Schatz, has largely cleared his touring schedule so he can stay home and be her caregiver through this difficult time. So they are facing a drastic loss of income, not to mention expenses that insurance does not cover. 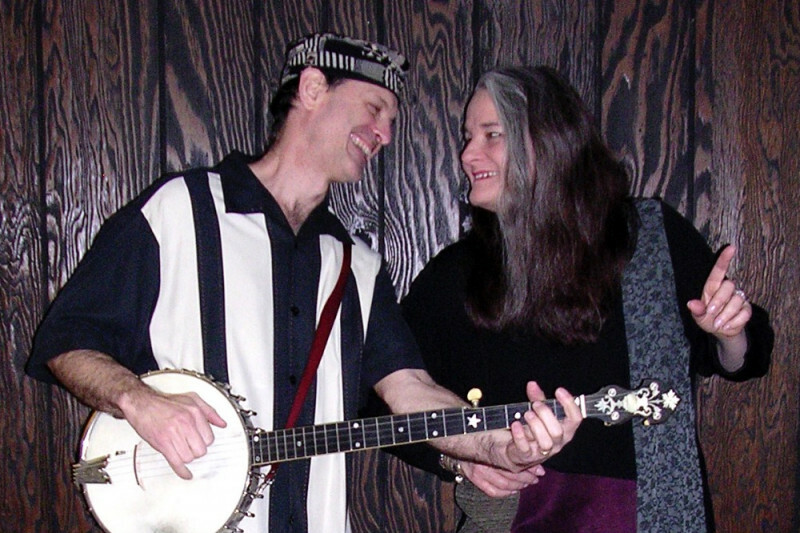 For most of her professional life Eileen has shared her love of traditional music and dance and has celebrated the value of cultural diversity through her theater presentations with Footworks Percussive Dance Ensemble and The Fiddle Puppets. She is a Certified Teaching Artist specializing in arts integrated residencies in the schools, and is devoted to community outreach programs, especially with at-risk teens. With great generosity of spirit and artistic vision she educates, entertains, and inspires folks of all ages and backgrounds across the United States and abroad. 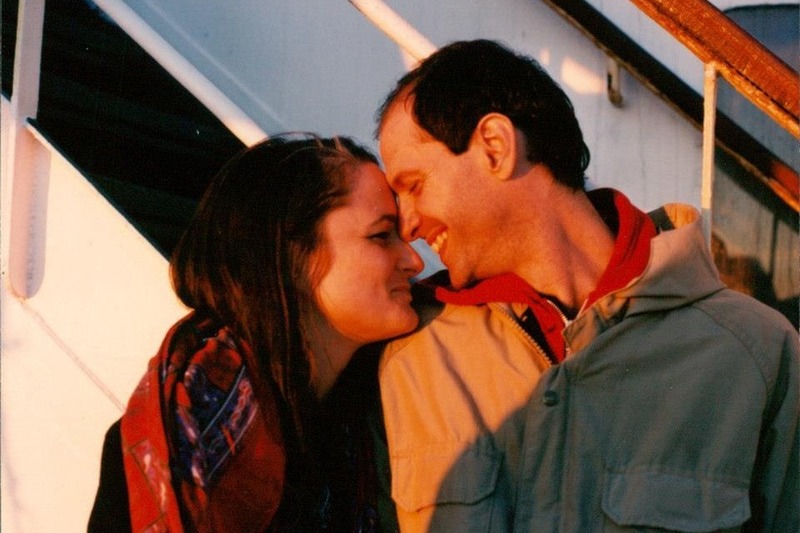 Mark & Eileen are humbled and bolstered by the generous donations and messages of love and encouragement they have received from friends and fans all over the world. If you have not yet made a donation, your help is welcome and appreciated. Expenses are expected to well exceed $50,000, so we will keep the campaign open in hopes of reaching $75,000. Please join hands and hearts as we bond together to visualize healing and lend our financial support. Love, Light, Hope, and Joy! Eileen continues to recover from surgery and in the coming weeks she will undergo additional chemo treatments. Meanwhile, Mark is also recovering from surgery to repair a shoulder injury that has kept him from performing. The donations from GoFundMe have allowed Mark & Eileen to focus on their health, and they could still use our support in this time of need. 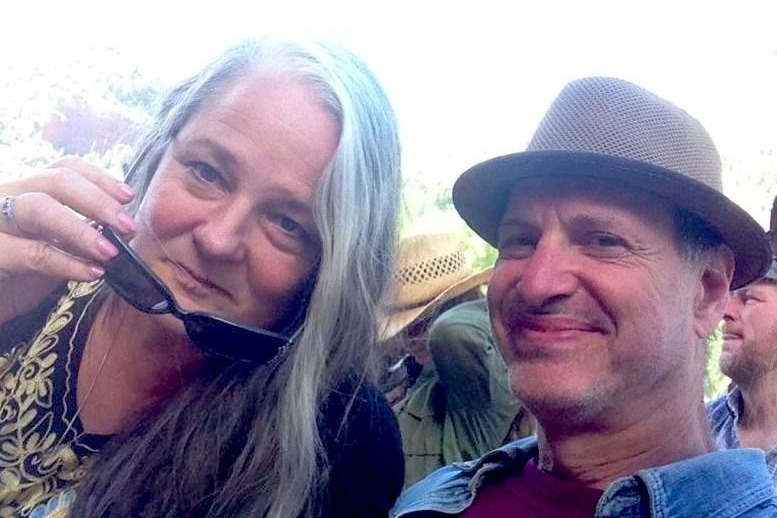 So please give if you can, share this post, and continue to send Mark & Eileen love! We went to Johns Hopkins early on October 30th and Eileen had a successful Whipple surgery. It’s a complicated 7-hour procedure and the recovery was quite challenging, keeping her there for just over three weeks. The team taking care of her round the clock at Hopkins was superb! I stayed there in the room with her giving her moral and hands-on support. Of course I was continuing my own recovery from rotator cuff surgery that I had on Oct 3. We sincerely thank all of the friends and family that dropped by bringing cheer, flowers, and food. Eileen was discharged on the November 21 and we were able to make it to Thanksgiving at my brother’s in Potomac the next day. Eileen’s meal was tomato soup, but we nonetheless felt like we sure had a lot to be thankful for! Her recovery at home has been slow but steady. There’s some pretty constant GI distress of one sort or another as her system gets used to the changes wrought within her. But we are assured that this will diminish with time as she slowly gets her strength back. In the meantime she decorated the house for Chanukah and we had a little gathering on the fourth night with family where I served my famous latkes and we did a hora around the family room to one of the rousing Chanukah songs. We are feeling very blessed to have good hope of beating this disease, and we once again thank all who have expressed love and support and contributed to make it possible for us to make it through this challenging time with minimal financial worries. Back in June Eileen's doctors switched to a more aggressive chemo treatment. Eileen and Mark met with their team of doctors at the Johns Hopkins Pancreatic Cancer Clinic this past week and are happy to report that the chemo treatments greatly reduced the cancer markers and arrested the growth of her tumor. Doctors now want to proceed to radiation and believe Eileen is a good candidate for life-saving surgery. Eileen still has a tough road ahead of her but continues to be a trooper. All of your contributions, messages of support, and prayers have worked wonders. 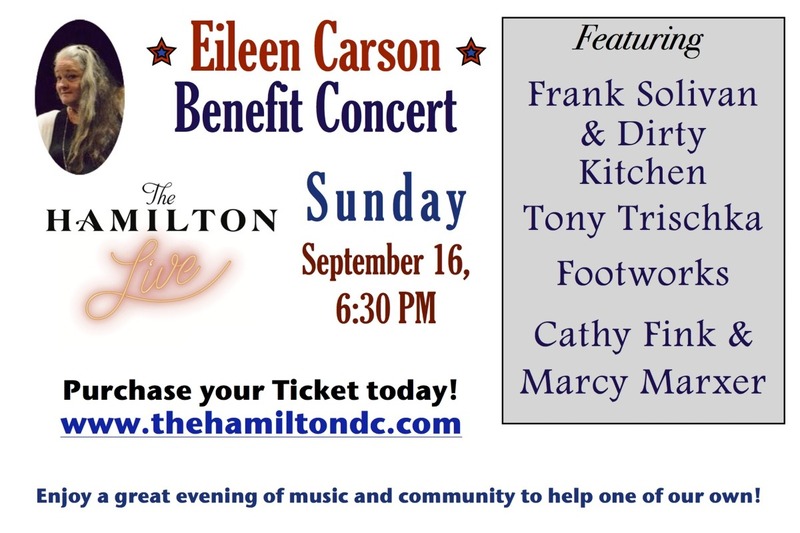 Mark your calendars for an incredible evening of music and dance at a benefit concert on September 16 at The Hamilton in Wash., DC, featuring Frank Solivan & Dirty Kitchen, Tony Trischka, Footworks, and Cathy Fink & Marcy Marxer. Visit bit.ly/2Mp30XV for info. If you can’t come but would like to contribute, please visit gofundme.com/sendeileenlove.